Halls filled with mini people, pictures of classes from the 1990s, and rooms that look familiar and foreign all at the same time. That could only be Parkside Middle School. 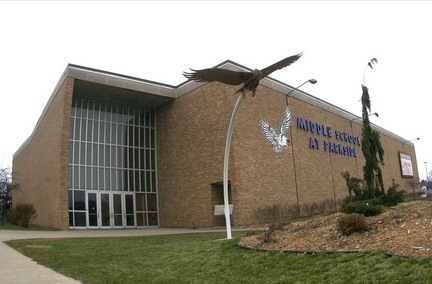 Well Middle School at Parkside, not PMS. I found myself back there (life is strange) obviously not as a student, but as a teacher to a 7th grade science class. I awkwardly had to call myself Miss Cash that day. I guess I forgot I'm a 25-year-old woman now. It was my first day of substitute teaching. A profession I intend on doing for as long as it takes to find me a job in my field. But don't just think I am using this as a way to make some money, that's only part of the reason. I'm lucky that I actually found something that I meet the qualifications to do. Just needing to have 90 credit hours from a university. I'm really doing this for the experience. Because everything in life is an experience. The more I live the more I thrive off challenges. Parkside was one of them. Being my first day of subbing ever, I was in a school that I had already been told had a hard time keeping good subs. It is a different school than than when I went there 11 years ago. Some things are the same. It still has great instructors, Hollywood and Vine is still hopping, and the students are still in teams. But the students have changed a bit and I think I was ready for them. My first assignment was just two hours. A good way just to get my toe wet. But I did have a few things against me. It was the first day back from the two week winter break and I mean look at me...I'm not that physically intimidating. However I do have quite the death stare. Not that I need to be intimidating, but I need to be taken somewhat seriously or I won't get anywhere. I was half expecting to be shuffled along by a hall monitor saying "get to class young lady!" That didn't happen. Phew. But I did fit in with the height demographic of the school. I never thought that I was really able to yell. I don't mean yell as in scold someone, but yell to actually be heard above a crowd. I learned I actually did develop a good yell, somewhere along the road. I did little more than babysit for two hours but I like to think I succeeded. No one got hurt and no one cried. Some students attempted to test me, tried to see how far they could go. I figured out early on that picking my battles was a good idea. Because if I gave attention to every little tattle, loud sound, or seat switch I would have spent two hours saying "don't, stop, leave her alone, watch your mouth, act your age!" I enjoyed talking to the kids one-on-one. Learning a little bit more about a few of them in the short time I had. I'm glad to be doing this because I like having the chance to effect kids in a positive way. To me it's not a bad way to make a buck.